For the last three years I met with Iain Sharp, at London Dorkbot and of course at Maker Faire UK. His stand always attracted a lot of people, so I decided to find out more about the man behind these wacky creations. When hearing about Lunar Lander, Three Blind Mice, Cyclepong and many more, your name comes to mind. How did it all start? What is your background? I loved making things as a child and studied electronics at university but, like a lot of people, I ended up doing the kind of engineering job that consists of writing PowerPoint charts. At a certain point, I realized that what I was paid to do had very little connection to what made me passionate about engineering, so I decided to find my way back in to making and doing stuff. My decision was well timed and coincided with growing interest in DIY technology in the wider community. I was lucky to connect with Dorkbot London who have provided constant inspiration and encouragement for my projects. Initially the projects were just done for my own interests and to show off a bit to my fellow geeks. As I became known in the technology community it lead to new opportunities to do work that was targeted at specific events and locations. One of the most enjoyable aspects of the site was getting to know Tim Hunkin through meeting his sister at Dorkbot and building the Cyclepong and Lunar Lander arcade machines that were located on Southwold Pier. Who is behind Lushproject.com? Are you on your own or are you working with a team? Lushprojects.com is my work but it draws heavily from inspiration provided by others. I love the complete geek-out which is Mike’s Electric Stuff and wanted to create something with a similar variety of projects to browse. Many of the projects have been done because I knew organizers of particular events and was able to persuade them to include some of my work. What drives you to create these fun projects? Because it’s better than sitting in front of the TV. Actually it’s hard to say. A lot of the time I get a “wouldn’t it be good if…” idea stuck in my head and the only way to get peace is to actually build the thing. Once you start building projects, the satisfaction of completing them becomes addictive. 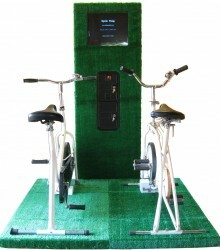 The project that was hardest to start but ended up being one of the most satisfying was Cyclepong. When I was out buying the old exercise bikes at a car boot sale the main thought in my head was, “this is crazy, are you ever actually going to finish this thing and if so what will you do with it?”. Some of your projects involve music or at least sound, are you a musician? My piano teacher had a nervous breakdown when I was about 6 and that ended my playing career, so not really. I do have an interest in music, and a lot of my friends are properly involved in music making. One interesting experience was helping a deaf lady build a simple electronic organ. Although she couldn’t hear the sound, she could feel the vibration of the speaker. It was great. 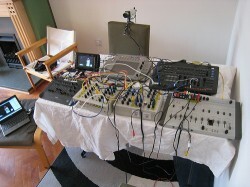 None of it has a permanent home right now but I expect to be doing some visuals based on my circuit-bent video equipment at the Festinho festival later in the summer. I am also taking circuit bent gear and Vibrati Punk Console kits to the Brighton Mini Maker Faire on Saturday 3rd September. Do you make these projects for fun only or are they commissioned? Mostly they are done on my initiative, but for things like the teaching workshops I normally work with an organizer to deliver something for a particular event. The biggest commission was building a second Cyclepong machine for Emma Freud after she fell in love with the original on Southwold Pier. Can you describe your latest project – the Vibrati Punk Console Electronics Kits which is endorsed by Forrest M. Mimms III? – great endorsement! What gave you the inspiration to creating this kit? The new generation of hobbyist-oriented startups like Adafruit and Oomlout are really good at encouraging people to take a punk attitude to commercially producing electronic kits. I wanted to try the “Here’s three chords – Now form a band” approach and see if I could get a kit in production that people would like and could use musically, or to learn to build electronics. A conversation with Aaron from Oomlout at Makerfaire UK this Spring inspired me enough to get out there and do it. Having run various courses for electronics novices, I felt I had an understanding of what explanations would help people learn and how to structure and pace material for learners. A lot of effort went in to designing the kit to be simple to build and in to creating well illustrated instructions that I hope anyone can follow. I chose to build from the Atari Punk Console because I had used it at one of my teaching workshops and I knew it was a fun design that made interesting sounds from a simple circuit. For those not familiar, the Atari Punk Console uses two interacting 555 timer chips to create sounds very much like the early 80s video games. To make it a bit more exciting I extended the original circuit with an extra oscillator which makes the range of sounds generated a lot richer. The nice encouragement from Forrest M. Mimms III was something that really amazed me. I put the project on the web and a couple of days later he contacted me. I was stunned but very happy. 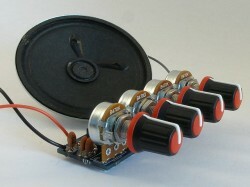 Do you buy the components and then build the kit or do you get a third party to put it together? My day job means that I am not always available to build and dispatch kits so I decided I needed to work with someone who could deal with the kit building. Also, I needed to control the up-front costs for this project so I was also looking for options to avoid having to build a lot of initial stock. I spoke to various people about doing a drop-shipping service and ended up working with BitsBox who run an independent web-based electronics shop. They have been extremely helpful. The initial circuit boards were produced by the DorkbotPDX PCB service who are also great. I notice that the kit is now for sale so who are the buyers? What do they do with it? Have you got some finished samples of their work? The kit has been on sale about 4 weeks and I am pleased with the interest generated so far. I didn’t really have much of a publicity plan when I started which amused the salesmen at work: “typical engineer, build something and then worry about how to sell it”. The first kits were built at Nottingham Hackspace which gave an opportunity to talk to people and see how they got on with it. One of the first builders was only 12 years old and he completed the kit fine with a bit of help from dad. That was very good. A friend who runs a small business told me that “you know all your first customers by name” and that proves to be very true. A lot of the initial buyers have sent me feedback. There is at least one nice blog write-up in Worldofnondo and another early builder has also written a review that we hope will be published in a well known music magazine. Most of the initial buyers were people looking for a kit that they could use to get themselves or their children in to building electronics. 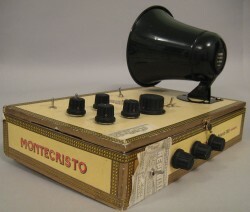 A few have also gone to musicians who want a novel source of sounds for live performance or sampling. I hope we’ll start to get more audio samples in the next few weeks. How do I get hold of a kit? Kits can be ordered online from lushprojects.com/vpc or contact me via lushprojects.com/contact if you are interested in a group order or UK-based building workshop. What do your customers have that I do not have? If I had a kit, I strongly believe that I would be able to put it together but then I am seriously lacking of imagination – what do I do with it? I guess you have to ask the users! One thing I’ve learnt from working with musicians is that any kind of unusual sound is something that triggers their imagination. For myself, I like to build things that look interesting and excite people’s curiosity. The kit really works well as something that can be packaged in fun ways like the Honkatron. The Vibrati Punk Console circuit is very open to modifications and enhancements and I hope people will play around and try different things out. For example you could try replacing some of the variable resistors with pencil lines and metal contacts or optical sensors to provide different ways to play the instrument. I hope to add some suggested modifications to the web site. According to your website you give courses – Electronics for Artists and Electronics for Absolute Beginners. What are the prerequisites of the courses? I believe that one does not need any knowledge beforehand for the Electronics for Absolute Beginners. Don’t they need a lot of imagination and creativity? Both courses were intended for people coming in with no past experience of electronics. They both provide a general practical introduction to electronics. The “For Artists” course adds a day on the Arudino controller which allows people to start to develop interactive installations. One of the things I try to do with both courses is to encourage people to play around and try different things. We had a great time doing Absolute Beginners at MzTek, when the group decided to start testing the electrical conductivity of their packed lunch items and building pencil-line organs that were also lovely drawings. What are the conditions before you agree to give a course? Enough notice, reasonable location and an interesting group of people. Not much more than that! What is your next project – can you talk about it or would you prefer to reveal it all when ready? Normally I don’t like to talk too much about what I am working on, but there is one long-term project that I do discuss. The working title is “post modern fortune teller” and the aim is to bring some of the magic of the 1950s and 1960s visions of the future to the present day. Suggestions from readers on what sort of technology driven fortune they would like to have are welcome via lushprojects.com/contact. What would your recommendation be for somebody who would like to emulate what you do? There are lots of great resources to learn technical skills. Take those as a beginning and start to play with the ideas by changing existing designs to do new things. Have fun and along the way you’ll also find you’ve learnt a lot. Find a local community to share ideas with. Is Lushproject.com a full time occupation or do you still have a 9-5 job? I still have a “proper” job. I don’t see Lushprojects providing a living wage soon. What I would say is that doing Lushprojects has encouraged me to think more creatively about my day job and given me a much broader range of personal skills to draw-on. Thank you Iain – hope to see you at the Brighton Mini Maker Faire.